Nuada was the first king the Tuatha Dé Danann, equivalent to the Gaulish Nodens and Welsh Nudd/Ludd. He was also called Nuada Airgetlám (Nuada of the Silver Hand/Arm) or Lludd Llaw Eraint (Lludd of the Silver Hand). Nuada was the god of the sea, healing, and warfare, linked to the Roman gods Mars and Neptune, and also the Norse god Týr/Tir. He is also associated with the sun, youth, beauty, writing, sorcery and magic. Nuada is associated with the Invincible Sword, the Sword of Light, one of the Four Treasures of the Tuatha Dé Danann. It was crafted by the poet (fili) and wizard Uiscias/Uscias in Findias, one of the ancient great cities of the Tuatha Dé. The sword was thought to only inflict mortal blows when drawn, cleaving its enemies in half. 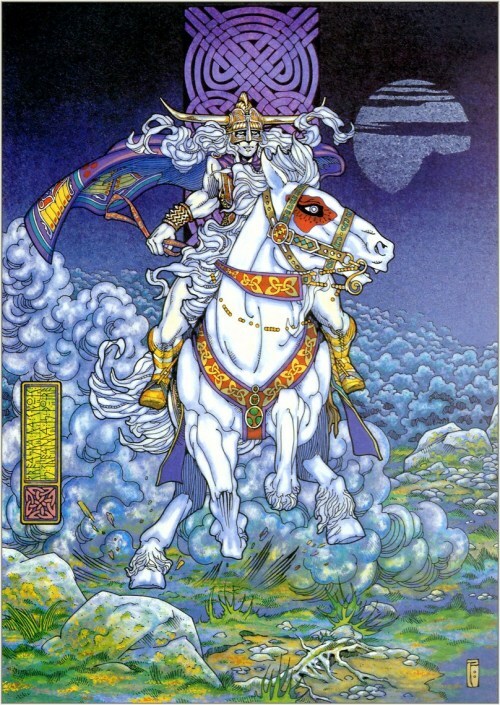 Nuada was king of the Tuatha Dé Danann before they arrived in Ireland. Upon reaching the emerald isle, they met the Fir Bolg, and challenged them to battle after unsuccessfully bargaining half the land for themselves. This was the First Battle of Mag Tuired, in which Nuada lost his hand/arm to the Fir Bolg champion Sreng. The Tuatha Dé Danann won the battle, and Sreng and the Fir Bolg were granted a quarter of the island, of which he chose Connacht. Since Nuada lost an arm in battle, he was no longer allowed to rule, as Tuatha Dé Danann kings must be physically perfect and ‘unblemished’. He was replaced by the half-Formorian Bres, who was quickly found unfit by rule by the Tuatha Dé people for his tyranny. Nuada’s brother Dian Cecht and the wright Creidhne crafted a beautiful silver arm for Nuada that would allow him to once again be king. Bres was removed from the throne, which led to the Second Battle of Mag Tuired. By this time, Lugh had joined Nuada’s court, and was a fierce opponent to the Formorians. During the battle, Nuada was killed by the Formorian Balor of the Evil Eye, however was avenged by Lugh who then killed Balor. 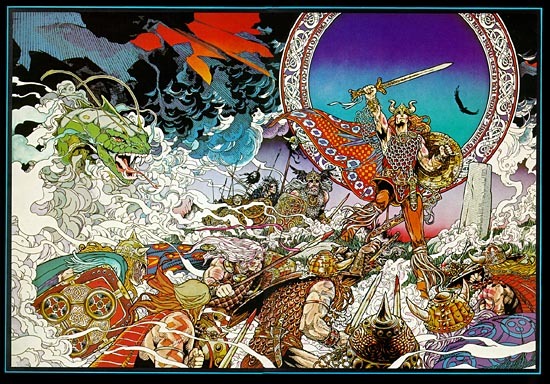 Lugh then took over as king of the Tuatha Dé Danann and reigned for many years. I love this story. I have done so much research on them. Celtic history is one of my favorites.